Fluoride refers to naturally occurring mineral salts of element fluorine. Fluoride is essential for preventing tooth decay (cavity formation) and also for proper tooth development. Fluoride refers to naturally occurring mineral salts of element fluorine. Fluoride is essential for preventing tooth decay (cavity formation) and also for proper tooth development. Major professional bodies of pediatric dentists recommend that drinking water for children should contain 0.7 parts per million (ppm) of fluoride. According to the federal Center for Disease Control and Prevention (CDC) fluoridated water is one of the most important health achievements of the previous (20th) century. Had it not been for this fluoridation campaign, incidence of tooth decay in USA would have been much greater. However, not every child has access to fluoridated water. Fluoride supplements are, therefore often recommended by pediatric dentists to protect against caries (cavities). Fluoride tooth pastes may also be advised. However, caution is important against giving your child too much fluoride. Therefore, it is important to give fluoride supplement only under professional advice. The outer layer on the visible part of each tooth is called the enamel. It is the hardest tissue in the human body, but is stable only in a basic environment like that provided by the saliva. It decays very fast in an acidic environment, which may be caused by bacterial decomposition of sugar in the food remnants sticking to the teeth. Acidic drinks and citrus juices can also cause the mouth to become acidic. The presence of fluoride in the teeth prevents the acid attack on the enamel. A deficiency of fluoride will permit decay of the enamel and formation of cavities. Fluoride can even reverse, to a certain degree, the formation of cavities already in process. Fluoride from drinking water, normal food, and supplements can be utilized by the developing teeth of children. A tooth which has already erupted, can be strengthened by topical application of fluoride. Fluoride can be topically applied to teeth of your children by the dentist in his office. Use of fluoride tooth pastes is another way of doing it. However, too much fluoridation must be avoided. 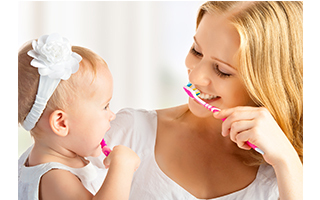 Children under two years should use only a smear of fluoride tooth paste on their brush each time. 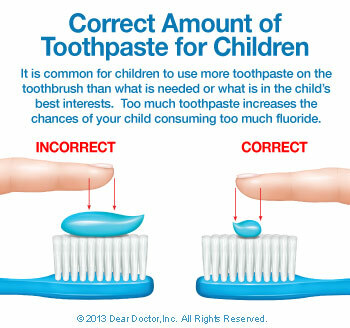 Children from 2 to 6 years should use about a pea sized amount of tooth paste. Teeth still forming below the gum line can develop a condition called tooth fluorosis. This is indicated by a streaked or mottled appearance of the tooth surfaces. Milder form shows in the form of white spots which may not be readily visible. In very severe, but rare cases, the discoloration can be darker and the surface may have a pitted texture. Fluorosis due to excess fluoride is not really harmful, except being aesthetically undesirable. But deficiency of fluoride can have serious consequences for your child’s dental health and comfort. The risk for fluorosis ends when most permanent teeth have formed, say by age 9. But before that all foods and supplements for the child must be carefully weighed in terms of the fluoride they can give to your child. The intake of fluoride is simply cumulative. However, the risk of over fluoridation is far overweighed by the risk of harm due to under fluoridation. If you need further information regarding fluoridation or fluoride supplements, please feel free to visit us at Barnaby Square Dental. We would love to see you at our office.